COSTA MESA, Calif. (AP) — The Chargers‘ Philip Rivers and Pittsburgh’s Ben Roethlisberger are playing some of the best football of their 15-year careers. If the postseason began this week, the Chargers would be facing the Steelers in a first-round game. Los Angeles (8-3) has a two-game lead for the AFC’s first wild-card spot while Pittsburgh (7-3-1) leads the AFC North and would be the fourth seed. 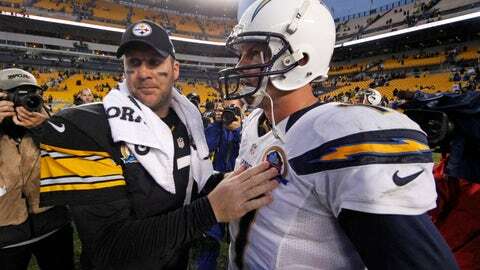 It is the sixth time the two members of the 2004 draft class have met but the first time since 2012, when the Chargers defeated the Steelers 34-24 in Pittsburgh. Roethlisberger though has the 3-2 edge in the series. Both have been in the league for 15 seasons, but Rivers acknowledged that he doesn’t know Roethlisberger very well. However, there is a mutual admiration between the two. “He’s an MVP-caliber player, and he’s playing at a MVP level right now,” said Roethlisberger of Rivers. Chargers offensive coordinator Ken Whisenhunt was Roethlisberger’s offensive coordinator when he was drafted in 2004 and spent three seasons with him. Whisenhunt has been Rivers’ coach for four seasons in two different stints and said he has been fortunate to see both at different stages of their careers. “Got two different guys that have managed to be successful. The one trait they both have is how competitive they are,” Whisenhunt said. Rivers comes into this game after having the most accurate passing performance in league history last week against Arizona, going 28 of 29 for 239 yards and three touchdowns in three quarters. He completed his first 25, which tied the league mark for consecutive completions and broke the record for the most to start a game. The performance drew plenty of plaudits from throughout the league, including Roethlisberger. “What he did last week was pretty spectacular — 25 in a row. It’s hard to follow all of the games on the west, so much but it’s easy because he’s a quarterback to kind of keep track of how he’s doing,” he said. Rivers is third in the league with a 115.7 passer rating and is averaging 9.1 yards per completion, which is fourth. He has thrown for two or more touchdowns in every game this season, becoming just the fourth in league history to do that in the first 11 games in a season. His biggest improvement though is in not taking risks. He has 26 touchdowns against six interceptions, and his 69.5 percent completion rate ties a career best. Rivers has said often this year it has been one of his goals to have a completion rate of 70 percent or more in a season. Roethlisberger though is also getting better with age. He has thrown for 3,664 yards, which is his most of his career through the Steelers first 11 games, and the 24 touchdowns are tied with his 2014 season. “Obviously he does a great job extending plays and is hard to bring down. He probably has made a lot more plays on the move than I have over the years,” Rivers said. A late-season matchup between Rivers and Roethlisberger is also appropriate considering they are in the top three since 2006 in regular-season wins once the calendar turns to December. Rivers is 39-19 to Roethlisberger’s 38-14. Only Tom Brady has more wins in that span with 44. Both feel fortunate to be linked to a 2004 quarterback draft class where all three, including Eli Manning, have remained with the same team. Roethlisberger has said it is even cooler when their group is compared with the 1983 class of Dan Marino, Jim Kelly and John Elway. While there is certainly competition between Rivers, Roethlisberger and Manning, Rivers said there isn’t a rivalry.